The CB-T1 is a great way to familiarize new employees with CableEye test systems during their orientation. Training may be selfdirected with this tool. 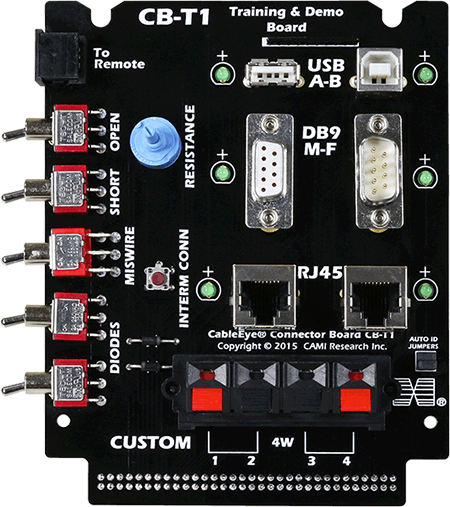 Populated with a few common connectors, the board allows trainees to methodically experience how the system responds to opens, shorts, miswires, diodes, resistance, and intermittent connections while at the same time learning to operate CableEye. The adapter board comes with identification LEDs for each connector that may be used to show the trainee operator which connector s/he must connect. As a system verification tool, the CB-T1 allows customers to verify the tester is working properly by quickly sampling the full spectrum of fault detection without use of example fault cables. The limitation of physical fault cables is that typically one example is needed for each fault. Use of the CB-T1 will provide a faster and more through verification process. The verification cable itself may be learned on first use, and loaded thereafter prior to going through a simple fault simulation procedure.